Yesterday we started the season with the first "Mores Creek Summit Backcountry" and "Winter Conditions; West Central Idaho Mountains" blogs posting. It was remarkable to learnt that people are finding NEW ways to have fun! Check the posting from Ralph at "Winter Conditions; West Central Idaho Mountains" blog. Play the video of the Igloo they built on the Freeman Peak ridge. SUPER COOL! This Sunday morning, December 27th, I am heading over to do some exploring around the Mores Creek Summit area, I will post "beta" on the latest conditions tonight. Those visiting the Payette Avalanche Center (PAC) website, will be pleasantly surprised about the significant improvements for this season. John, Dave, and Alpeh have done a remarkable job. With this posting I will share additional information about the snow conditions leading to the"deep" instability we are observing at Mores Creek Summit (and surrounding areas) snowpack. The next three charts correspond to Mores Creek, Big Creek, and Banner Summits, notice the "Snow Water Equivalents (SWE = amount of water) and/or snow depth. These charts are representative of backcountry areas frequented by Boise area ski tourers. Basically a shallow layer of snow sat for three weeks starting in late November through mid December. This period was characterized by clear weather and cold temperatures that promoted the development of advanced and large facet crystal through out our local mountains. Heavy snow precipitation resumed during December16-17th burying these "persistent" facet crystals. These large facets and angular crystals in the OLD snow have a structure that makes molecular bonding with the NEW snow, composed mostly of small rounded and fragmented grains, very difficult. The bonding process has been further inhibited by the large difference in crystal sizes between the slab (0.5 mm) and facets (2-3mm). Thus, we should be prepared to be dealing with this "deep instability" for a long while! 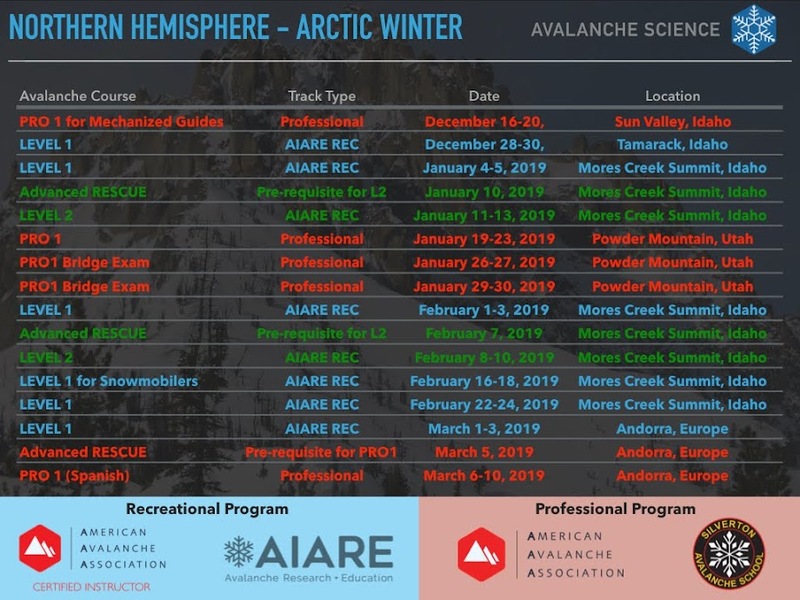 As I noted in yesterday's blog posting, we need to be mindful of the Mores Creek Summit areas that released during the December 17th "Natural Avalanche" cycle. The snow cover for these avalanche starting zones and avalanche paths are now much thinner now (30-50 cm), and are more susceptible to faceting. To ease the tracking of areas that recently released, I include below three topo maps with recent avalanche releases colored in yellow. Areas where naturals releases were expected during December 17th natural avalanche cycle, and/or that I have observe avalanche releases over the last 18 years are colored in red. Do not forget that south aspects in the topo maps were not a problem during December 17th avalanche cycle. I should note that NOT all areas with potential to slide are included in the topo maps. That will be an impossible task, and winter travelers need to manage terrain, evaluate conditions, and practice safe travel at all times. Any pictures and/or observations of avalanches during the last instability cycle are appreciated, since it will greatly help in keeping current the Mores Creek mapping of likely avalanche paths and slopes. In the past I had requested feedback through the Blog on the name used by some of us for the Mores Creek Summit ski runs. 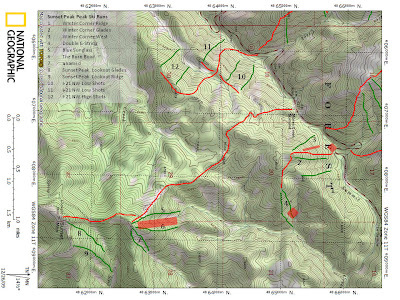 The above topo maps list some names for popular ski runs (green traces) at Pilot, Freeman, and Sunset Peaks areas. Feel free to suggest more compelling names! The red traces are for typical up track routes. One more detail, the topo maps are printed in UTM coordinates. These coordinates are better for navigation in the ground, and for reading directly from the maps coordinates to be shared through the blog, or even in the case of an emergency.